President Obama, during an unexpected visit to the daily White House press briefing, told reporters today that he is an "eternal optimist" and expects Democrats and Republicans to reach a consensus on energy legislation. The president's remarks followed a meeting with both Republican and Democratic congressional leaders regarding jobs and the economy. Mr. Obama said that House Minority Leader John Boehner complimented the Democrats' interest in pursuing nuclear energy and clean coal technology, but he said Republicans have to accept more than that. "I'm willing to move off some of the preferences of my party in order to meet them halfway, but there's got to be some give from their side as well," the president said. 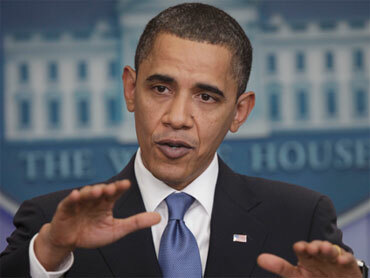 Promoting both clean fossil fuel use and alternative energy is "the right thing to do," Mr. Obama added. "And all I can do is just to keep on making the argument about what's right for the country and assume that over time people, regardless of party, regardless of their particular political positions, are going to gravitate toward the truth."